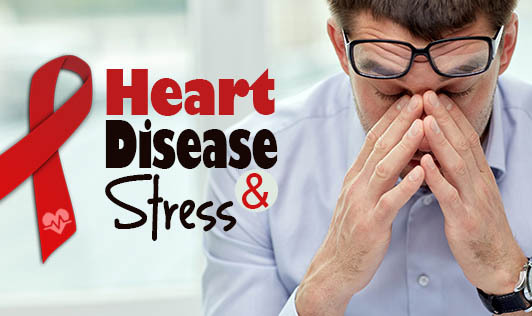 Are stress and heart disease related? Does stress increase the risk of heart disease? Stress is a normal part of life. But if left unmanaged, stress can lead to emotional, psychological, and even physical problems, including heart disease, high blood pressure, chest pains, or irregular heartbeat (arrhythmias). Medical researchers aren't sure exactly how stress increases the risk of heart disease. Stress itself might be a risk factor, or it could be that high levels of stress make other risk factors (such as high cholesterol or high blood pressure) worse. For example, if you are under stress, your blood pressure goes up, you may overeat, you may exercise less, and you may be more likely to smoke. If stress itself is a risk factor for heart disease, it could be because chronic stress exposes your body to unhealthy, persistently elevated levels of stress hormones like adrenaline and cortisol. Studies also link stress to changes in the way blood clots, which increases the risk of heart attack.